On a cool crisp winter morning I pause to watch in nature’s emergency response to the “devastation” brought to the natural world. Denuded trees initially stripped of all there leave are flushed with green new growth almost like a second spring. The growing greens mix with cinnamon hues of orange and red of other tree species in a shortened color intense fall-like display. This mismatch of out of sync mixture of fall and spring seems be part of the healing process across the broken landscape. Just like the human response, it takes time but life gets a little closer to normal each day. Many of our natural coastal ecosystems are internally programmed for emergency response. Sand dunes undercut by raging waves initially have steep slopes exposing sea oat rhizomes and roots. A visit to the beach during the calm after the storm reveals gentle movement of dune sands to cover exposed areas using the forces of gravity wind to slide loose soil sediments, re-planting exposed vegetation. You can can actually see and hear this natural process which occurs without any human assistance. The sand takes care of the plants which in turn help the sand remain in place as growth of the dune is re-established. 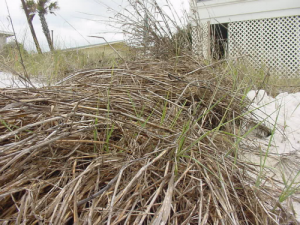 Panic grasses at the beach also have an interesting storm response. Initially these plants appear to be severely damaged when knocked over and upright stems contact the ground. Surprisingly this one of the ways these grasses multiple. Every stem node or joint can actually produce new upright growth dramatically increasing coverage of these important dune grasses. Perhaps the most emotional symbol of the storms damage outside of homes, business, and church buildings are the loss of our trees. These once proud guardians provided decades of relief from heat in the summer, homes for wildlife, made our neighborhoods a little more secluded, and shaped our vision home more than ever realized. Without ceremony our trees were not thanked for their service but cut and dumped along the roadside. It’s hard to see any silver lining with massive roots exposed or snapped tree trunks doting our iconic landscape. In a completely natural setting, downed pine trees create opportunity for hardwood species like oaks to grow quickly creating new wildlife habitat. There’s more light reaching the forest ground. Eventually natural forces of fire may tip the balance back toward pine tree species as the ecosystem responds to changes. Snapped tree trunks and fallen tree actually provide important habitat for wildlife and birds. There’s ecological value in a snag! Cavity nesting birds like some species of woodpeckers, nuthatches, and chickadees make their homes in dead and decaying wood. Snags are also used as perches by predatory bird likes hawks and owls. Squirrels, possums, raccoons, salamanders, and a variety of insects find homes or food in and around decaying wood like snags or fallen trees.